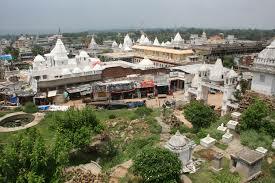 Here is Some Information about Sammed Shikharji Temple in Giridih Jharkhand. 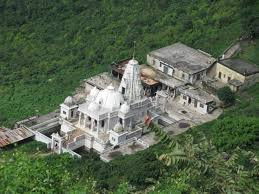 Sammed Shikharji Temple is located in Giridih district in Jharkhand India and also Known as Parasnath Hill.The temple at Shikharji is a new construction with some parts dating to the eighteenth century. However, the idol itself is very old. Sanskrit inscriptions at the foot of the image date to 1678 AD. 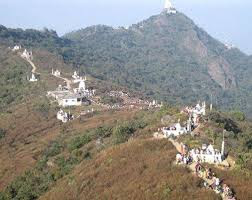 According to Jainism, following 20 out of 24 Tirthankaras attained Nirvana here so this place is known as Sammed Śikhar or Sammet Shikhar, the ‘peak of concentration’.The hill is also known as Parasnath Hill, a name derived from Parshvanatha, the 23rd Tirthankara who attained Nirvana here.Parasnath Hills stand as the highest mountain peak (1366 m) in the state of Jharkhand and highest mountain range after the Himalaya Mountains. 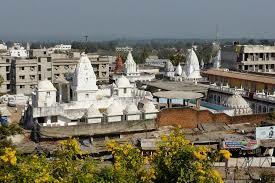 It is one of the most popular sights of Jharkhand, which include a number of temples. 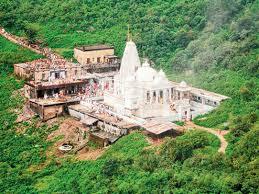 On the mountain top there is the Shikharji Jain Temple, an important Tirtha or Jain pilgrimage site. Parasnath Hill is surrounded by a deep forest called Madhuvan, and it was hundreds of miles from populated areas until a few centuries ago. The Jain literature is the text where one could find some references about this hill. In the text they have mentioned the hill as a holy place for meditation. Jnatrdharmakatha says everything about their history. In the 12th century, Parsva had mentioned many things in the book. People renovated the pilgrimage between 1925 and 1933. They also made some small temples there and put the Lord Aadinath, Lord Vasupoojya, Neminath, Mahavir and Chandranan etc. in the temples. The statues of Lords are very old and they are at that place from 1678. Parasnath is the "Marang Buru "or hill deity of the Santhal of Hazaribagh, Manbhum, Bankura and Santhal Parganas and each year they assemble at the period of the full noon in Baisakh (mid April) from these district and celebrate a religious hunt for three days. On one hand the Hill is place of worship and adoration on the other hand it is worthseeing place in the sense of tourism. Tourists start to visit from the second fortnight of December to last week of January. (1) Beespanthi Kothi – There are facilities for about more than 2000 pilgrims. Rooms, Halls and flats well equipped with all necessary facilities are available here as per desire of pilgrims. (2) Terapanthi Kothi – This Kothi has the capacity to facilitate about 3000 Pilgrims. Many other Dharmashala, Guest House are available under other organizations. Bed, food and utensils are available at all three places. By Road : There are Public and Private vehecals available to Reach Sammed Shikharji Temple Giridih district in Jharkhand.One has to pass through some places to reach the Parasnath hill, such as Rachi, Bokaro, Jhumri Tilya, Dhanbad and Hazaribagh. By Train : The Nearest Railway station is Parasnath railway station.You can easily get regular trains to Parasnath from other major cities of the country.Express Trains also have a stoppage here.The place near the station is known as Isri Bazar. One could also get down at Nimia Ghat station to reach the place. New Delhi Rajdhani express, Mumbai-Howrah mails are the popular trains, if anyone wants to book the tickets. Bty Air: Parasnath does not have an airport. The Nearest airport is Ranchi Airport.